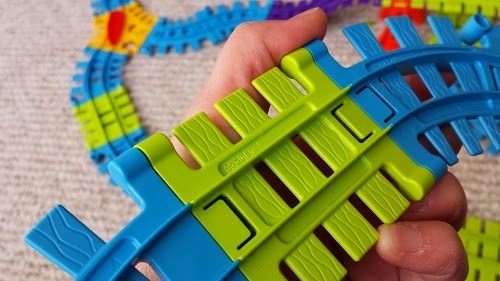 Toys As Tools Educational Toy Reviews: Review & Giveaway: Modular Toys: It's State-of-the-Art Play! I really love to explore well-designed toys with my kids. When I talk about good design, I am not just talking about how cool something looks. Actually, when I talk about good design, I am talking about how well something actually works. 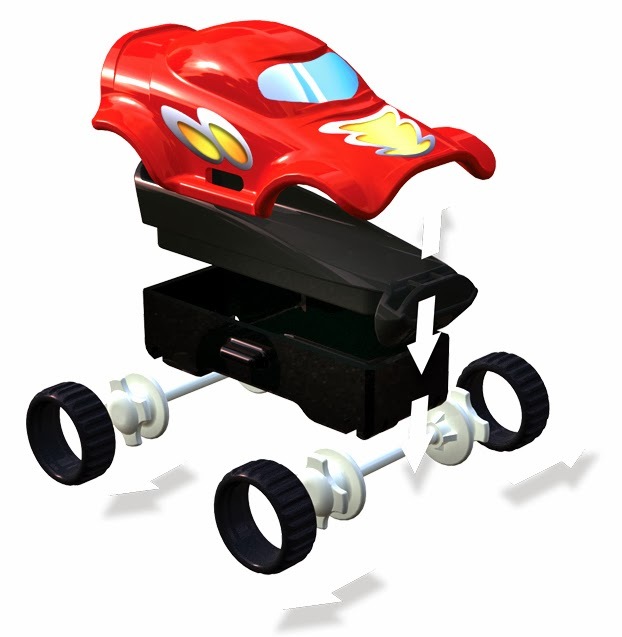 Test out various cars on your Modular Toy set. Each car will behave differently. I like that. - toot-tooting the horn of a steam engine.. obviously pretend. - going down a steep slope with your "racecar"... you shouldn't have to wholly pretend that, right? Your car should roll down the slope on its wheels by force of gravity and velocity, right? 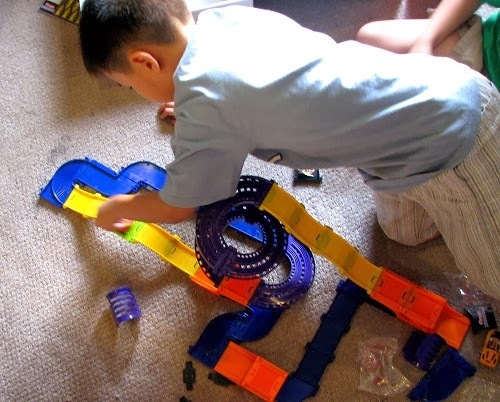 It's like having a marble run but the marble really doesn't run, you have to push it down. Who would buy that? No one. 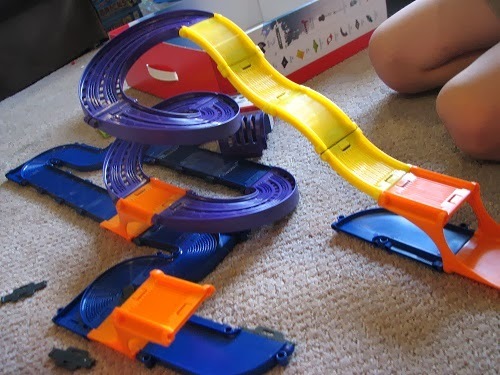 So why buy a racetrack set that doesn't allow for smooth rides. Very lightweight but it rolls well on their tracks. Some racecar toys are quite flashy but the design doesn't allow for real experimentation with the laws of gravity and that isn't cool. 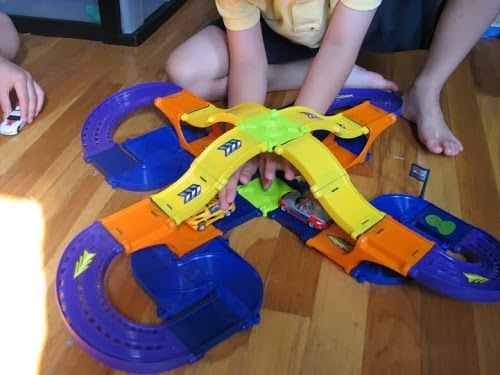 Experimentation, stunts.... that is the #1 greatest thing about racetrack toys. They encourage kids to try out the laws of physics without a textbook, without a teacher. Want to know how kids learn through play? This is it. We don't realize this but this is how we all learned this stuff. We didn't start learning physics in the 10th grade! 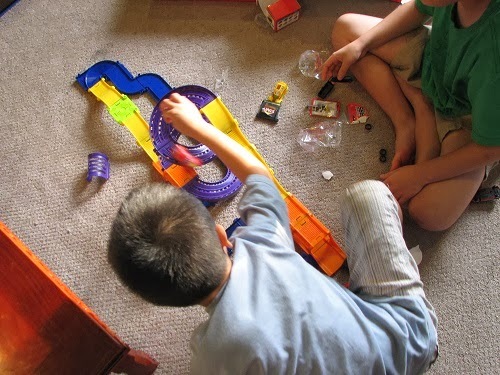 We began learning physics starting Day 1 but I think as kids, we really started learning a lot more once we started to play with physics via toys. Tester 1's favorite question is "What if?" As a mom, I really hate when he tries to answer this question. Sometimes he makes a horrific mess (What if I poured this shampoo into the bathtub? all of it?)... but when I stand back and take things into perspective, I know that it is good that he is teaching himself these things via play. I don't know if that means he will ace AP Physics but I do know that he will know at least SOMETHING when he takes that class in high school. 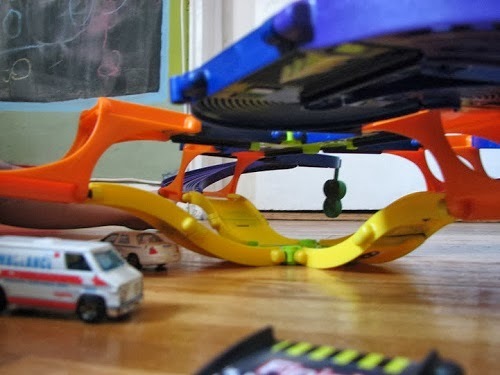 Playing with physics-based toys like this will provide a healthy foundation. I know it will. See this guy in shorts? This was taken in 2012! Yeah, we've had these a while and they work just as they did on the first day we got them. we learn as we play, watch the end of this video. it's so cute! If you could describe the sound of learning, what kind of noise would it be? Snap, Crackle, Pop? How about Cam Jansen's CLICK? 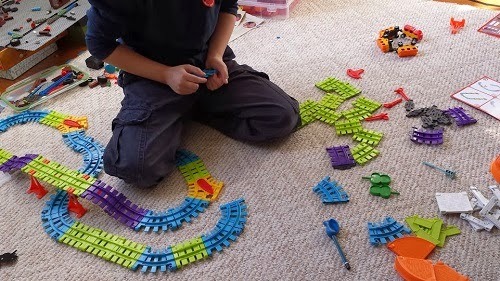 I really like Modular Toys because of the way it is made to click together, easily. 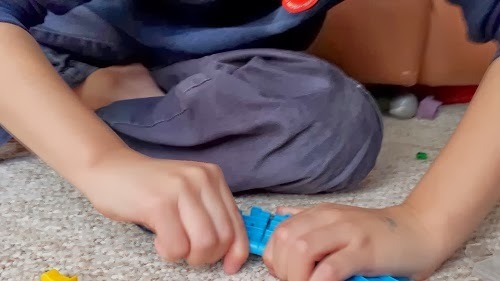 Children are encouraged to use both hands and bring it to a center focus where they will make a connection. 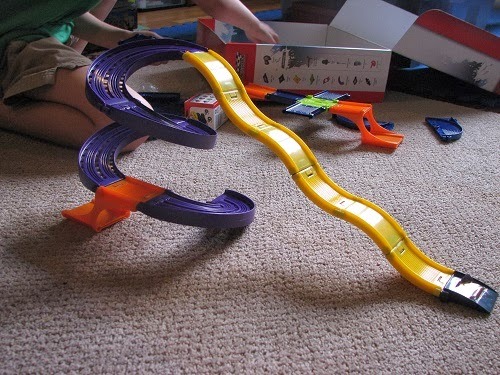 They must do so every time they change up the tracks. These toys definitely invite open-ended building (instructions are provided but even instruction-loving Tester 2 decided to make his own). Good muscle building opportunities here. 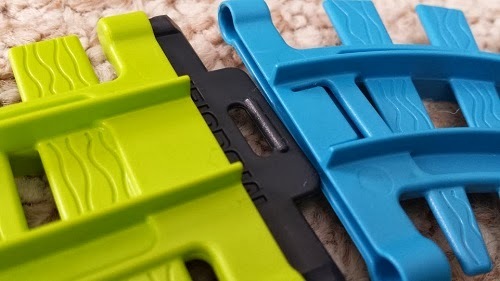 If you can pull out the connector, there is a little separator that comes in each box and that does the trick. Creating extensive tracks could lead to problems - and that is the fun part. Children do not realize this but open-ended building means that unforeseen problems lie ahead. 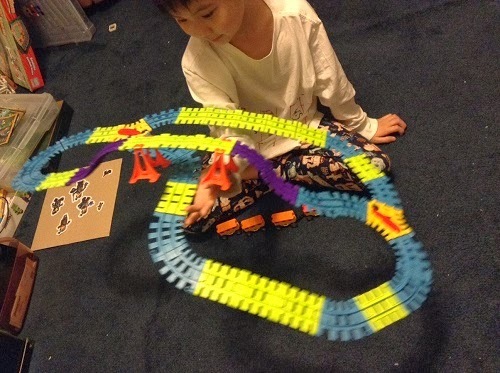 It always will because kids have either a limited amount of space or a limited amount of tracks. This is good because it really propels them to solve their own problems. And they cement the learning with each and every track they click together. CLICK! One thing that I love love love about the 3D Racecar toy is that it doesn't require tons of space. It doesn't require your child to want to go to the top of the bunkbed and make him tape a track from the bed to the floor (true story). Nope, we don't have to worry about that here. This is because the daring stunts will have be made in your child's head first. 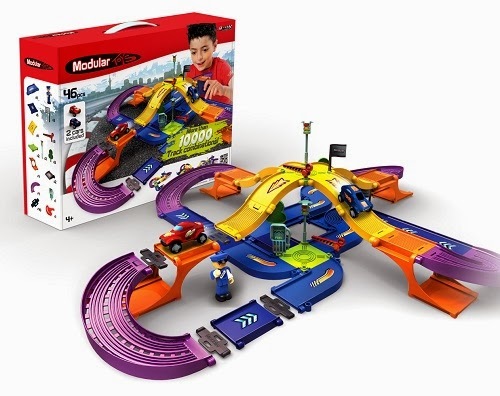 He will make them happen with his tracks because the plastic is soooo well-made (I hear it is the same as the plastic used for medical grade products and will try to confirm that in the future). 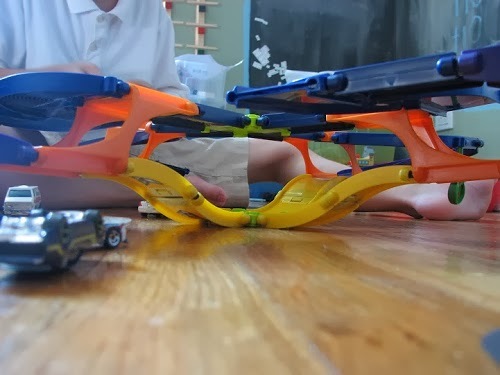 The tracks are very strong but incredibly light and this allows for vertical building.. like spirals! Think about how your car hugs the road when you made sharp turns on the highway. These are things that can be explored with your child's toy. Is this symmetrical? I don't know why I can't answer this question. I am thinking no but there is something very math-y about it. MOM, MOM!!!! Watch this... I Can Turn It UPSIDE-DOWN!!! 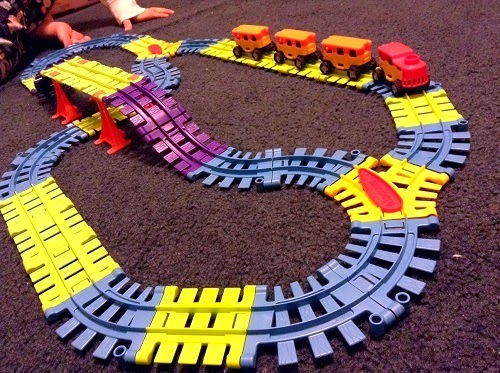 My kid likes making funny things with his tracks. It's more than a racecar toy to him. Parts are assigned a color but really, it's all quite easy. That is the good part. When building is easy, you are encouraging higher level creating. Lots of educational experts say that too.. give the kids calculators so that they can do more complex math problems. Simply beautiful, don't you think? Colors work for girls too but Modular Toys pink-purply toys too. 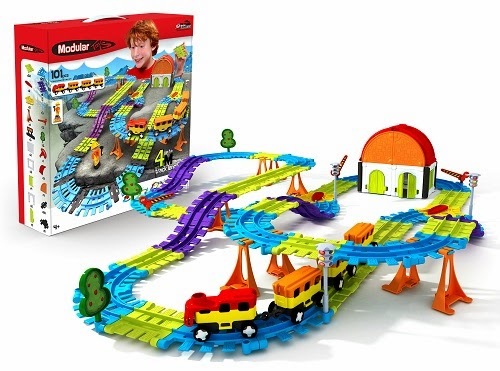 When is the last time your kid picked up an entire deluxe track set with one hand. You know what this means? You can change playrooms without taking it apart... hence no more tears. What happens when you are making vertical tracks? Answer: you moving your body around and around. You're going up and down and guess what else? Your friend is very close by. This set really allows for kids to build with each other and talk with each other as they play. Check out the video and you see these two kids practically on top of each other and they love it. It's very conducive to building joint attention skills (Look, watch this!) which I consider to be a critical classroom learning skill. This picture was taken on the first day of play. I swear they did it for over 6 hours, only stopping for dinner. No fighting. No blood. Only storytelling and crazy physics fun. There are town buildings that go with these toys and so you can create a whole world. I love that. This particular set comes with a building too! Discovering toys like these and telling you about them is what makes my job so incredibly fun. I really want all of our kids to have such excellent quality toys. 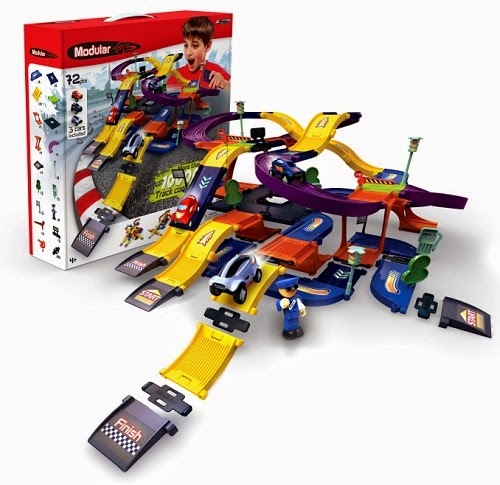 Believe me, I have spent and received more than $200 worth of popular racetrack car toys but and that is way before we found Modular Toys. They are more than just racecar and train toys. They encourage so many other skills that are at the very core of why kids play. Want to buy it on Amazon??? Use my links to support Toys Are Tools! The kids love to have race cars do stunts and jump. They never liked the wooden train tracks because they didn't hold together well with their rough play. I excited about this set because it looks so sturdy and I love the idea of being able to move it easily without taking it apart! My son builds tracks in our living room and is always re-configuring them and pretending it is a pretend world, with trains and people. I also like the modular castle. 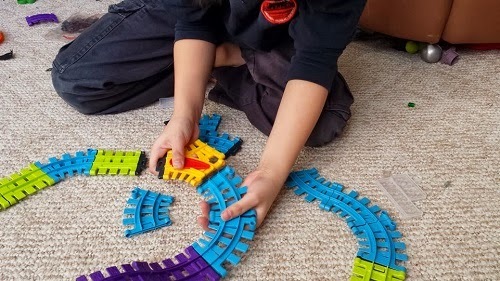 My little grandson plays with trains on both plastic and wooden tracks. With cars he goes all over the place and likes to use the furniture. I also like their Modular Characters - they look like fun! There would seem to be a lot of potential for other modular play sets in addition to the castle...how about a farm or a school (a school bus would be pretty cool!). ohmigosh, now that you say that... I am wondering where our builder guy is. must go find him... he must be under a couch somewhere. be careful not to trip. you are kind to let him go all over the place. ooooh, airport sounds like a great next step. Thomas will outlive us all. I can't believe how much money we spent on all those trains. My girls love trains - It started with Thomas and now they can't get enough of them. 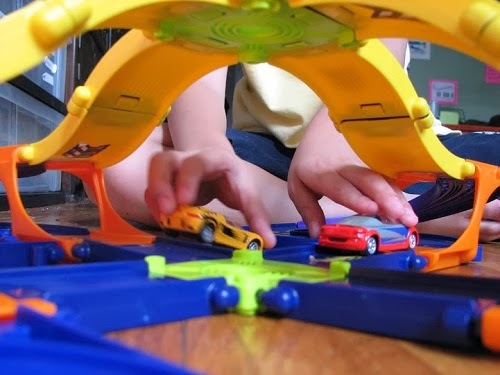 They also love to play with cars, and they zoom around with them all over the house. Thank you for the wonderful giveaway. I love the modular town! So cute! My kids like to mix it up, and use everything at once! They love sets that they can do their ow thin with. The Castle Architect set would be awesome. They make up stories and drive them all over the house! I like the Town builder! One thing that we have run into here is that if you have built lots of LEGO creations using instructions, then you are bound to know a thing or two. Sometimes, kids get sad when they don't make something so beautiful. But my little one last night started out really small and made himself happy. I think we should all do this when we are weaning off from instructions. And please read the Pick A Brick story. An easy way to make something super cute is by getting things of the same color!